Internal network test labs have diminished in popularity, and for a good reason: Network functionality evolves faster than ever and multiple layers complicate testing. Moreover, integration with the cloud results in difficult replication. Keeping an in-house lab up-to-date requires considerable expertise and money—two things most IT teams don't have to spare. 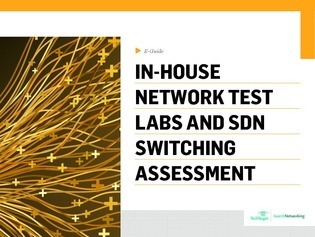 In our e-guide, learn how to avoid the cost and complexity of maintaining an internal network test lab by utilizing a virtual test environment. Additionally, get expert insight on topics like SDN switching at UNH InterOperability Laboratory, network telemetry, Microsoft’s federal court cloud case, and the Delilah Trojan.